Horse stalls are the confined areas in a barn in which a horse or other animal is kept. The two most common horse stall designs are standing stalls and box stalls. Box stalls, AKA loose boxes, are the best for keeping horses healthy and providing rest. Standing stalls are also usable for horses if they are wide enough to allow enough movement. Horses like to lay down in stalls and a the tie stall design does not allow for this. Horses also have trouble with swelling in their legs when they are confined. Originally range animals, equines suffer from 'stocking up' or swelling in the lower legs when they cannot move around freely. 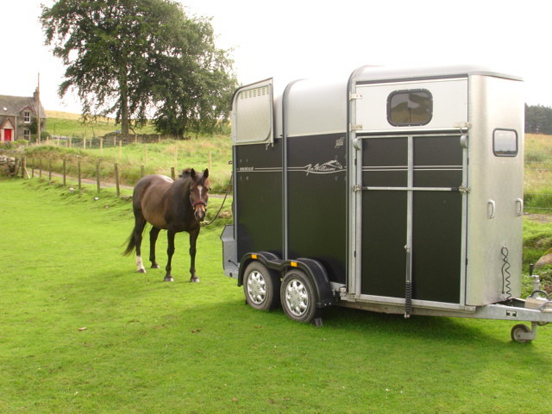 A box stall helps to prevent swelling, but some horses will stock up no matter what type of stall they are in. When building a horse stall attention should be paid to the wood species. Some woods are better than others for horses. Horses are known for chewing and knowing on wood. They get board when stabled all the time, or even part of the time, so they take out some of their boredom on the stall walls. Some wood species are very harmful to horses. Walnut is one of the worst. If a horse stands in black walnut sawdust for just a few hours they can founder. Any type of fruit or nut trees species are harmful to them. Hardwoods such as oak are ideal for building stalls from. It is a very hard wood and holds up well again both horsey teeth and being kicked. For those who live in an area with hardwood forests, purchasing oak might be economical. Many times local sawmills have lumber that is not good enough to be made into furniture. They may sell and entire bundle (a bundle can be as much as one to three pick up loads) for a mere $150. For people on the West Coast the only readily available wood might be pine. Pine is a soft wood and horses like to chew it, but if that is all that is available, here are a few things you can do to make it more durable for the horses.